A weed wrench that's been popular since 1913. 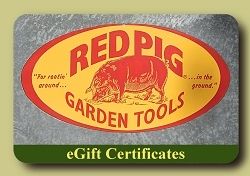 One of the simplest, easiest to use, stand up weeding tools is the Wrench now being marketed by an Oregon company as "Grampa's Weeder." Invented back in 1913, the Weed Wrench was once produced in a number of variations by a variety of manufacturers. (I have one in my collection produced in the 1930's in Riverside, California.) Today there's just one version and, fortunately, it's a very good one. The tool consists of a cast iron head on the end of a three foot long wood handle. 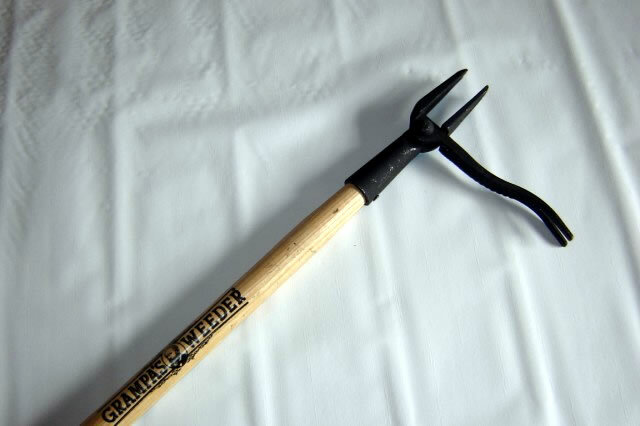 The head is essentially a 2-prong fork with an L-shaped, 2 pronged foot pad lever riveted to it. You center the 4 prongs over a weed, press your foot on the footpad and push the weeder into the ground. As the lever hits the ground the prongs grip the weed's roots tightly. You lean the handle towards the footpad and, "Pop," out comes the weed, root and all. One caution, this tool is for small to medium, herbaceous weeds. It's not for ripping the stubs of sapling trees from bone dry earth. I once had a customer try that and she destroyed one very well built tool. There's a different tool for that job. But if you need to yank weeds from a standing position, Grampa's Weeder is your Huckleberry. Manufactured by Grampa's Weeder. The size and shape of this item means we must charge an additional $8 shipping fee to our flat rate shipping rate to accommodate for the actual cost of shipping it.